Kalen Christ is being touted as the original McWhistleblower. He’s the 21 year old who “kicked Ronald McDonald in the McBottom”. 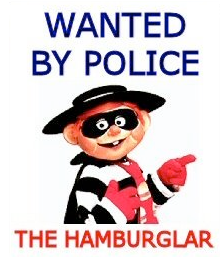 His courageous act revealed the use the temporary foreign workers at three McDonald’s locations in Victoria that ignited a federal investigation and a national moratorium on the temporary foreign workers program within the entire restaurant sector in Canada. If you haven’t heard this story yet, perhaps you’ve been too long in the McDonald’s play area. Christ has worked at McDonald’s for four years, and he has said that his decision to blow the whistle on his bosses has caused him grief at work. Co-workers turned their backs on him. Management took away his keys and office privileges, and even assigned him to clean the bathrooms, which he doesn’t normally do as a full-time team leader responsible for training new employees. This started more than a year ago, when the three McDonald’s restaurants – all owned by the same franchisee – began bringing in full-time temporary workers from the Philippines, while the hours of local employees were cut. Christ was assigned to train the new workers, who were paid $2 more an hour than he was. Christ started wondering why McDonald’s would hire foreign workers when there so many local people who would love to have the jobs. In fact, he interviewed a local candidate who was excited about the prospect of working at McDonald’s. But she wasn’t called back or hired. Christ complained to a manager and was told the company was obligated under contract to give the foreign workers full-time hours, and that they were reliable employees willing to work graveyard shifts. He began to research the TFW program, and found out the government only allows companies to bring in foreign workers in cases where qualified Canadians are not available. So Christ contacted a lawyer. The lawyer said it was pointless to sue a billion-dollar corporation like McDonald’s and told Christ to go to the news media instead. So he did. He emailed CBC and the McNews broke on April 7. But over time, things improved since McDonald’s Canada took over the three restaurants and the local franchisee was sent McPacking. Christ’s hours have been restored, a new regional manager has been playing nice, and the foreign workers are warming up to him again. Can restaurants only stay open if they hire foreign workers? Do restaurants abuse the program? People would argue either way. We couldn’t agree more. We salute this courageous whistleblower! It’s the tenth annual Corporate Compliance and Ethics Week. What better way to participate than incorporating a strong compliance program, including a whistleblower hotline, that your employees can use to anonymously report any perceived wrongdoing 24/7/365.